The Yasaka-Saigon-Nha trang Hotel will make a new record banh tet, a cylindrical glutinous rice cake filled with green bean paste and fat pork, following its annual traditional activity of making this record Vietnamese rice cake. 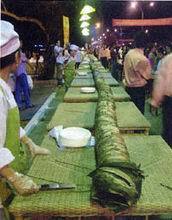 The cake this year will be 33-meter long, cooked and cut following traditional practices. It will have different kinds of stuffing according to regional customs. The 2008 celebrations will include a cake procession and cooking ceremony at 4 p.m. on February 5 and the cake will be fished out of the boiling pot at 9 a.m. on February 6 and cake-cutting ceremony and "Loc Xuan May Man" (Spring Luck) program win take place at 7p.m. on February 6. The cake will then be served to tourists and locals. Many traditional games will be organized on the beach in front of the hotel, such as o quan (similar to Mancala game), water-carrying, rowing on sand, tug-of-war, walking on stilts, calligraphy, and more. From the first to the fourth day of the lunar year, a Vietnamese cuisine buffet will take place in the natural atmosphere of Vietnam countryside in the hotel's garden, with purely traditional Vietnamese food such as banh chung (square glutinous rice cake), banh tet from many regions, rice pancake, pig's head soaked in vinegar, meat with bamboo sprouts and spring rolls, to name just a few.